Hi Everyone! Thank you all sooooooo much for participating in my end of year Weaving giveaway!! I have thoroughly enjoyed reading your posts, your sharing of your own creative goals and inspirations for next year have totally re-invigorated me during this end of year mid-winter slow-down. I have revisited my own goals for 2013, and refined some, added some new ones, and am excited about the directions and possibilities for some more fibery creativity in the coming months. Starting with the Beginners Spindling workshop at Woool in the Hague, I hope the first of many more workshops to come on various topics and in various places! I am also excited about my weaving discoveries and hoping to continue those as i journey down the path of warps and wefts. I have some new ideas for art yarns too, and different ways of preparing fibers that I want to try out, and of course will be sharing those here! With some luck, there may also be some travel for us this year as a family, I would love to visit with my parents and family in New Zealand as soon as we can get our butts over there, but yep, that will take luck AND some seriously careful budgetting. Unless someone invents a Matter Transporter very soon that is, or the Dr drops by in the Tardis and offers us a lift. Finally, I am planning some fun new additions to this website in the coming months! Something that will allow more interaction and participation, I hope! I will let you know when I am sure my plans can be created as I would like. However, right now, the MOST important thing is, I would like to wish you and your loved ones, a most Merry Christmas and a Happy New Year, I hope you can share this time with the people most loved by you, doing the things that bring you the most bliss. And if its not Christmas that you celebrate, I hope you still get to take some time out with friends, family, and blissful activities! I will be emailing you shortly for your postal address and this weaving will soon be winging its way to you! I so wish I could be sending something to everyone who took the time to pop by and comment and share ideas and goals, I hope that at least you might have found something new, interesting, useful, or inspiring in my newsletters this year, and downloaded your free ebook if either of those currently on offer are on interest to you. You can find all those things on the Downloads page. 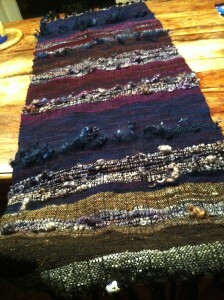 Annie, congrats with the beautiful woven scarf of Suzi. I will wish you all a wonderful Christmas and a creative 2013! Oh my gosh! I am so beyond surprised, thrilled and excited!!!!! I can’t believe I won! ME! I just can’t believe it!!!! I am so grateful! Thank you so much and thanks for the congrats, everyone!!!! I’m going to continue dancing!!! I LOVE Woolwench and her products!!!!! WOOT! Congratulations to Annie!! I learned something very important on your postings—Saori Weaving. 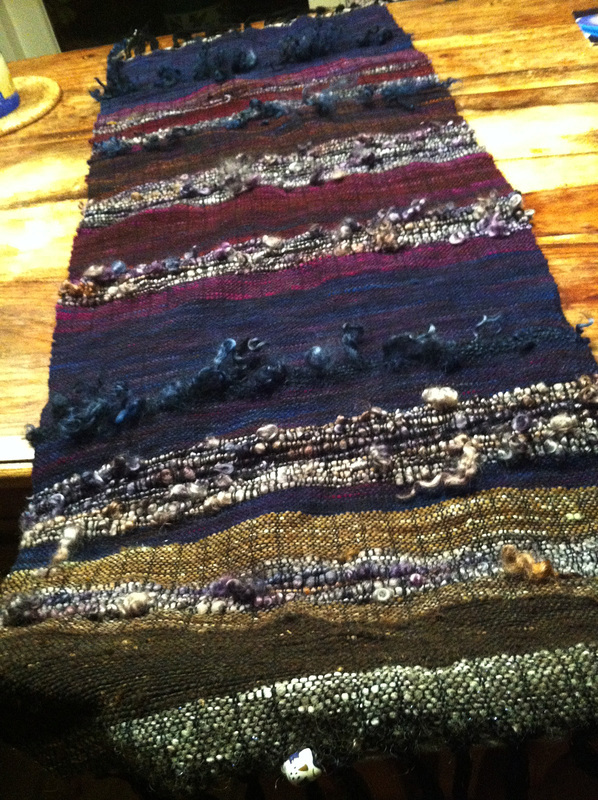 As a weaver from waaaaay back my wovens are much more structured. Congrats to Annie, and to Suzy for a successful year! What a great way to welcome a creative new year! Congrats Annie! Congrats to Annie!!! and thanks to Suzy for sharing such a wonderful gift..and all that you have gifted to us this past year..in blogs..and videos… Wishing a wonderful Christmas to you.. and the Lucky Winner!